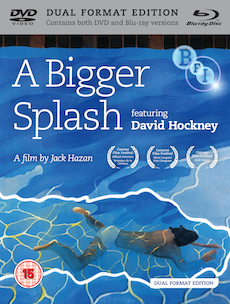 Director Jack Hazan and writer David Mingay (Rude Boy) had access to David Hockney and his circle from 1971 to 1973, a critical period for the internationally-acclaimed artist, during which time they crafted this groundbreaking and enthralling docu-drama, celebrating Hockney's life, work and milieu. With appearances by such art scene icons (and subjects of Hockney's paintings) as Celia Birtwell, Ossie Clark, Henry Geldzahler and Patrick Proctor, this mesmerising portrait is presented here, along with little-seen archive documentaries on Hockney, for the first time on Blu-ray. Love's Presentation (UK, James Scott, 1968, 28 minutes): a short film capturing the creation of Hockneys Cavafy Etchings. Portrait of David Hockney (UK, David Pearce, 1972, 14 minutes): a short portrait of Hockney in his home and studio.